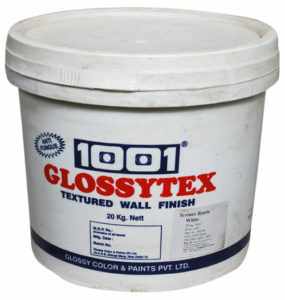 Description : GLOSSYTEX is an advanced decorative and protective textured finish with a wide range of features for Exterior and interior surfaces. Uses : GLOSSYTEX is an advanced decorative and protective textured finish with a wide range of features for Exterior and interior surfaces. It provides a durable attractive decoration for almost any exterior and interior surface. It is a great weather resistant water proof coating with a life of more than a decade. Color Range : As Per as shades cards.